The 2018 Isuzu MU-X facelift gets new safety features and a refreshed fascia, bringing up to speed with other full-size SUVs in this segment. The 2018 Isuzu MU-X facelift has been officially launched in India with prices starting at ₹ 26.34 lakh for the 4x2 version, going up to to ₹ 28.31 lakh for the 4x4 version (all prices ex-showroom, Delhi). The SUV was first launched in India in 2017, replacing the Japanese automaker's older flagship SUV, the Isuzu MU-7. The facelifted MU-X comes with some considerable cosmetic updates along with some new and updated features as well. Mechanically, the 2018 Isuzu MU-X SUV remains unchanged with no change to the engine whatsoever. The Isuzu MU-X facelift continues to be powered by the same 3.0-litre diesel engine that is tuned to produce 174 bhp and 380 Nm of peak torque. The oil burner comes mated to a 5-speed automatic transmission as standard, in addition to a 4x4 Terrain Command variant that comes with a shift-on-fly dial. Internationally though, the MU-X facelift was launched with a downsized 1.9-litre diesel for South East Asian markets. Visually, however, the 2018 Isuzu MU-X comes with a bunch of updates. Stating with its face, the SUV now features a slightly updated grille, which is flanked by a pair of new and more aggressive-looking headlamps with projector lens and LED daytime running lights. The front bumper has also been changed and now the SUV features a more aggressive fog lamp design with dark chrome eyebrow-like inserts. The facelifted MU-X also gets a set of new twin-five-spoke alloy wheels, while the rest of the profile remains unchanged. Isuzu MU-X facelift will also sport revised taillights, new bumper styling and a large roof spoiler at the rear. The cabin remains largely similar to the existing version but gets new upholstery for the seats, and few new features on offer. 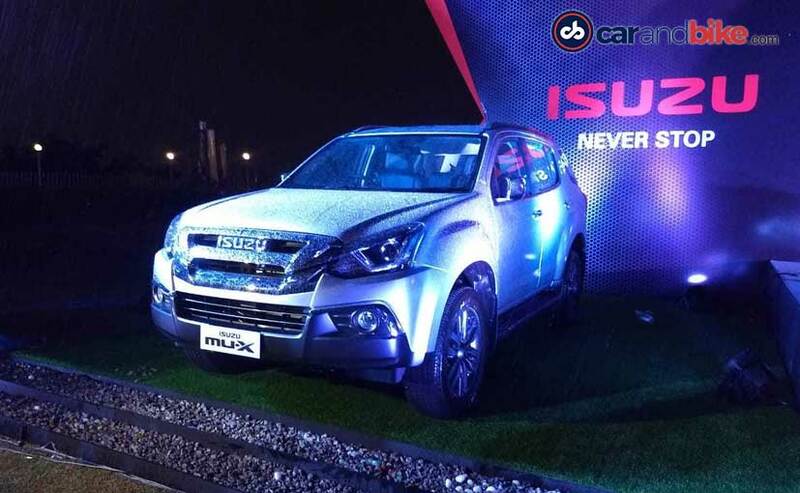 Improving safety levels on the SUV, Isuzu is now offering six airbags as standard on the MU-X as opposed to the previously available two. The 2018 Isuzu MU-X continues to lock horns with its fellow full-size SUV models like the Toyota Fortuner, Ford Endeavour, Skoda Kodiaq, and the recently launched new-gen Honda CR-V. In fact, the five-seater Volkswagen Tiguan can also be considered a rival, with regards to the price point. In any case, the MU-X was in need for some comprehensive updates to the car which makes it more relevant and keeps up with its competitors.